"SQR codes" redirects here. For codes "SQR", see SQR (disambiguation). For codes "QR", see QR (disambiguation). QR code (abbreviated from Quick Response Code) is the trademark for a type of matrix barcode (or two-dimensional barcode) first designed in 1994 for the automotive industry in Japan. A barcode is a machine-readable optical label that contains information about the item to which it is attached. In practice, QR codes often contain data for a locator, identifier, or tracker that points to a website or application. A QR code uses four standardized encoding modes (numeric, alphanumeric, byte/binary, and kanji) to store data efficiently; extensions may also be used. The Quick Response system became popular outside the automotive industry due to its fast readability and greater storage capacity compared to standard UPC barcodes. Applications include product tracking, item identification, time tracking, document management, and general marketing. The QR code system was invented in 1994 by the Japanese company Denso Wave. Its purpose was to track vehicles during manufacturing; it was designed to allow high-speed component scanning. QR codes are now used in a much broader context, including both commercial tracking applications and convenience-oriented applications aimed at mobile-phone users (termed mobile tagging). QR codes may be used to display text to the user, to add a vCard contact to the user's device, to open a Uniform Resource Identifier (URI), to connect to a wireless network, or to compose an email or text message. There are a great many QR code generators available as software or as online tools. The QR code has become one of the most-used types of two-dimensional code. At the application layer, there is some variation between most of the implementations. Japan's NTT DoCoMo has established de facto standards for the encoding of URLs, contact information, and several other data types. The open-source "ZXing" project maintains a list of QR code data types. QR codes have become common in consumer advertising. Typically, a smartphone is used as a QR code scanner, displaying the code and converting it to some useful form (such as a standard URL for a website, thereby obviating the need for a user to type it into a web browser). QR code has become a focus of advertising strategy, since it provides a way to access a brand's website more quickly than by manually entering a URL. Beyond mere convenience to the consumer, the importance of this capability is that it increases the conversion rate: the chance that contact with the advertisement will convert to a sale. It coaxes interested prospects further down the conversion funnel with little delay or effort, bringing the viewer to the advertiser's website immediately, where a longer and more targeted sales pitch may lose the viewer's interest. Although initially used to track parts in vehicle manufacturing, QR codes are used over a much wider range of applications. These include commercial tracking, entertainment and transport ticketing, product and loyalty marketing and in-store product labeling. Examples of marketing include where a company's discounted and percent discount can be captured using a QR code decoder which is a mobile app, or storing a company's information such as address and related information alongside its alpha-numeric text data as can be seen in Yellow Pages directory. They can also be used in storing personal information for use by organizations. An example of this is Philippines National Bureau of Investigation (NBI) where NBI clearances now come with a QR code. Many of these applications target mobile-phone users (via mobile tagging). Users may receive text, add a vCard contact to their device, open a URI, or compose an e-mail or text message after scanning QR codes. They can generate and print their own QR codes for others to scan and use by visiting one of several pay or free QR code-generating sites or apps. Google had an API, now deprecated, to generate QR codes, and apps for scanning QR codes can be found on nearly all smartphone devices. QR codes have been incorporated into currency. In June 2011 The Royal Dutch Mint (Koninklijke Nederlandse Munt) issued the world's first official coin with a QR code to celebrate the centenary of its current building and premises. The coin can be scanned by a smartphone and link to a special website with contents about the historical event and design of the coin. In 2014 the Central Bank of Nigeria issued a 100-naira banknote to commemorate its centennial, the first banknote to incorporate a QR code in its design. When scanned with an internet-enabled mobile device, the code goes to a website which tells the centenary story of Nigeria. In 2015, the Central Bank of the Russian Federation issued a 100-rubles note to commemorate the annexation of Crimea by the Russian Federation. It contains a QR code into its design, and when scanned with an internet-enabled mobile device, the code goes to a website that details the historical and technical background of the commemorative note. In 2017, the Bank of Ghana issued a 5-cedis banknote to commemorate 60 years of Central Banking in Ghana, and contains a QR code in its design, which when scanned with an internet-enabled mobile device, that code goes to the official Bank of Ghana website. Credit card functionality is under development. On February 20, 2016, the Reserve Bank of India (RBI) will[needs update] launch the eponymously named Bharat QR, a common QR code jointly developed by all the four major card payment companies - National Payments Corporation of India that runs RuPay cards along with MasterCard, Visa and American Express. It will also have the capability of accepting payments on the unified payments interface (UPI) platform. QR codes are used in some augmented reality systems to determine the positions of objects in 3-dimensional space. URLs aided marketing conversion rates even in the pre-smartphone era, but during those years faced several limitations: ad viewers usually had to type the URL and often did not have a web browser in front of them when they first viewed the ad. The chances were high that they would forget to visit the site later, not bother to type a URL, or forget what URL to type. Semantic URLs decreased these risks but did not eliminate them. With the advent of smartphones the issue of viewers not being able to access a website immediately has become less of an issue, however the trouble of typing in URLs still remained and thus QR codes were utilised in order to allow redirecting to URLs for instant access. QR codes can be used to store bank account information or credit card information, or they can be specifically designed to work with particular payment provider applications. There are several trial applications of QR code payments across the world. In developing countries like India and China, QR code payment is a very popular and convenient method of making payments. In November 2012, QR code payments were deployed on a larger scale in the Czech Republic when an open format for payment information exchange — a Short Payment Descriptor — was introduced and endorsed by the Czech Banking Association as the official local solution for QR payments. In 2013, the European Payment Council provided guidelines for the EPC QR code enabling SCT initiation within the Eurozone. QR codes are commonly used in the field of cryptographic currencies, particularly those based on and including Bitcoin. Payment addresses, cryptographic keys and transaction information are often shared between digital wallets in this way. QR codes can be used to log into websites: a QR code is shown on the login page on a computer screen, and when a registered user scans it with a verified smartphone, they will automatically be logged in. Authentication is performed by the smartphone which contacts the server. Google tested such a login method in January 2012. By specifying the SSID, encryption type, password/passphrase, and if the SSID is hidden or not, mobile device users can quickly scan and join networks without having to manually enter the data. Note that this technique is valid for specifying only static SSID passwords (i.e. PSK); dynamic user credentials (i.e. Enterprise/802.1x) cannot be encoded in this manner. As of January 2018, iPhones have this feature built into the camera app under iOS 11.x. Android users may have the feature built into one of the device's stock apps (e.g. Samsung Galaxy S8/S8+/Note8 users can launch the stock browser, tap the browser's 3-dot menu, then choose "Scan QR code") or can install one of several available free apps such as "Barcode Scanner" or "QR Droid" to perform the QR Wi-Fi join. In 2008, Ishinokoe in Yamanashi Prefecture, Japan began to sell tombstones with QR codes produced by IT DeSign, where the code leads to a virtual grave site of the deceased. Other companies, such as Wisconsin based Interactive Headstones, have begun implementing QR codes into tombstones. In 2014 the Jewish Cemetery of La Paz in Uruguay began implementing QR codes for tombstones. QR codes are also used in scanning TOTP secrets to generate time based one time passwords. Japanese immigration landing permission with a QR code at the bottom. The QR code content is encrypted. Encrypted QR codes, which are not very common, have a few applications. For example, there is an Android app, that manages encryption and decryption of QR codes using the Data Encryption Standard algorithm. The Japanese immigration system usage of encrypted QR codes on landing permission stamps in passports, is another example. Popular video games, such as Fez, The Talos Principle, and Watch Dogs, have incorporated QR codes as story and/or gameplay elements. QR Codes have been used by various retail outlets that have loyalty programs. Usually, these programs are in the form of an app that users can download onto their phone and comes with a feature to scan QR codes, which are found printed on the receipt received when making a purchase, allowing users to collect award points simply by scanning the code. Unlike the older, one-dimensional barcodes that were designed to be mechanically scanned by a narrow beam of light, a QR code is detected by a 2-dimensional digital image sensor and then digitally analyzed by a programmed processor. The processor locates the three distinctive squares at the corners of the QR code image, using a smaller square (or multiple squares) near the fourth corner to normalize the image for size, orientation, and angle of viewing. The small dots throughout the QR code are then converted to binary numbers and validated with an error-correcting algorithm. 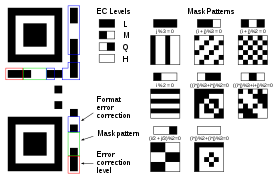 Level L (Low) 7% of codewords can be restored. Level M (Medium) 15% of codewords can be restored. Level Q (Quartile) 25% of codewords can be restored. Level H (High) 30% of codewords can be restored. In larger QR symbols, the message is broken up into several Reed–Solomon code blocks. The block size is chosen so that at most 15 errors can be corrected in each block; this limits the complexity of the decoding algorithm. The code blocks are then interleaved together, making it less likely that localized damage to a QR symbol will overwhelm the capacity of any single block. Due to error correction, it is possible to create artistic QR codes that still scan correctly, but contain intentional errors to make them more readable or attractive to the human eye, as well as to incorporate colors, logos, and other features into the QR code block. It is also possible to design artistic QR codes without reducing the error correction capacity by manipulating the underlying mathematical constructs. The format information records two things: the error correction level and the mask pattern used for the symbol. Masking is used to break up patterns in the data area that might confuse a scanner, such as large blank areas or misleading features that look like the locator marks. The mask patterns are defined on a grid that is repeated as necessary to cover the whole symbol. Modules corresponding to the dark areas of the mask are inverted. The format information is protected from errors with a BCH code, and two complete copies are included in each QR symbol. The message dataset is placed from right to left in a zigzag pattern, as shown below. In larger symbols, this is complicated by the presence of the alignment patterns and the use of multiple interleaved error-correction blocks. The general structure of a QR encoding is as a sequence of 4 bit indicators with payload length dependent on the indicator mode (e.g. byte encoding payload length is dependent on the first byte). Character Count Indicator depends on how many modules are in a QR code (Symbol Version). Four-bit indicators are used to select the encoding mode and convey other information. After every indicator that selects an encoding mode is a length field that tells how many characters are encoded in that mode. The number of bits in the length field depends on the encoding and the symbol version. This has the exception that the last character in an alphanumeric string with an odd length is read as a 6-bit value instead. 06 6 15 F 24 O 33 X 42 . The following images offer more information about the QR code. IQR Code is an alternative to existing QR codes developed by Denso Wave. IQR codes can be created in square or rectangular formations; this is intended for situations where a rectangular barcode would otherwise be more appropriate, such as cylindrical objects. IQR codes can fit the same amount of information in 30% less space. There are 61 versions of square IQR codes, and 15 versions of rectangular codes. 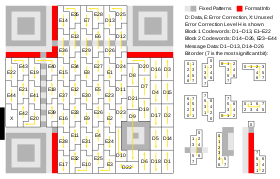 For squares, the minimum size is 9x9 modules; rectangles have a minimum of 19x5 modules. IQR codes add error correction level S, which allows for 50% error correction. IQR Codes have not yet been given an ISO specification, and only proprietary Denso Wave products can create or read IQR codes. Secure Quick Response code (SQRC) is a type of QR code that contains a "private data" segment after the terminator instead of the specified filler bytes "ec 11". This private data segment must be deciphered with an encryption key. This can be used to store private information and to manage company's internal information. FrameQR is a QR code with a “canvas area” that can be flexibly used. In the center of this code is the canvas area, where graphics, letters, and more can be flexibly arranged, making it possible to lay out the code without losing the design of illustrations, photos, etc. Model 1 QR code is an older version of the specification. It is visually similar to the widely seen model 2 codes, but lacks alignment patterns. The use of QR code technology is freely licensed as long as users follow the standards for QR Code documented with JIS or ISO. Non-standardized codes may require special licensing. Denso Wave owns a number of patents on QR code technology, but has chosen to exercise them in a limited fashion. In order to promote widespread usage of the technology Denso Wave chose to waive its rights to a key patent in its possession for standardized codes only. In the US, the granted QR code patent is ‹See Tfd›US 5726435 , and in Japan ‹See Tfd›JP 2938338 . The European Patent Office granted patent "EPO 0672994". to Denso Wave, which was then validated into French, UK, and German patents, all of which expired in March 2015. The text QR Code itself is a registered trademark and wordmark of Denso Wave Incorporated. In UK, the trademark is registered as E921775, the word "QR Code", with a filing date of 03/09/1998. The UK version of the trademark is based on the Kabushiki Kaisha Denso (DENSO CORPORATION) trademark, filed as Trademark 000921775, the word "QR Code", on 03/09/1998 and registered on 6/12/1999 with the European Union OHIM (Office for Harmonization in the Internal Market). The U.S. 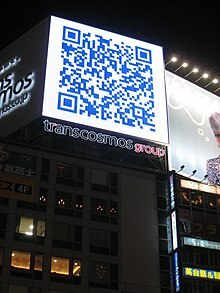 Trademark for the word "QR Code" is Trademark 2435991 and was filed on 29 September 1998 with an amended registration date of 13 March 2001, assigned to Denso Corporation. In the case of no software exploits, malicious QR codes combined with a permissive reader can still put a computer's contents and user's privacy at risk. This practice is known as "attagging", a portmanteau of "attack tagging". They are easily created and can be affixed over legitimate QR codes. On a smartphone, the reader's permissions may allow use of the camera, full Internet access, read/write contact data, GPS, read browser history, read/write local storage, and global system changes. Samples of the High Capacity Colored 2-Dimensional (HCC2D) code: (a) 4-color HCC2D code and (b) 8-color HCC2D code. Researchers have proposed a new High Capacity Colored 2-Dimensional (HCC2D) Code, which builds upon a QR code basis for preserving the QR robustness to distortions and uses colors for increasing data density (at this stage[when?] it is still in prototyping phase). The HCC2D code specification is described in details in Querini et al. (2014), while techniques for color classification of HCC2D code cells are described in detail in Querini and Italiano (2014), which is an extended version of Querini and Italiano (2013). Introducing colors into QR codes requires addressing additional issues. In particular, during QR code reading only the brightness information is taken into account, while HCC2D codes have to cope with chromatic distortions during the decoding phase. In order to ensure adaptation to chromatic distortions which arise in each scanned code, HCC2D codes make use of an additional field: the Color Palette Pattern. This is because color cells of a Color Palette Pattern are supposed to be distorted in the same way as color cells of the Encoding Region. Replicated color palettes are used for training machine learning classifiers. ^ "QR Code features". Denso-Wave. Archived from the original on 29 January 2013. Retrieved 3 October 2011. ^ a b c "QR Code Essentials". Denso ADC. 2011. Archived from the original on 12 May 2013. Retrieved 12 March 2013. ^ a b Borko Furht (2011). Handbook of Augmented Reality. Springer. p. 341. ISBN 9781461400646. Archived from the original on 21 December 2016. ^ Joe Waters. "How to Use the Top QR Code Generators". Dummies.com. Archived from the original on 11 September 2017. Retrieved 5 June 2017. ^ a b "QR Code—About 2D Code". Denso-Wave. Archived from the original on 5 June 2016. Retrieved 27 May 2016. ^ a b "QR Code Standardization". QR Code.com. Denso-Wave. Archived from the original on 10 May 2016. Retrieved 23 May 2016. ^ "ISS QR Code|AIM Store: Historical Archive". Aimglobal.org. Archived from the original on 8 August 2016. Retrieved 26 May 2016. ^ "ISO/IEC 18004:2006 - Information technology – Automatic identification and data capture techniques – QR Code 2005 bar code symbology specification". www.iso.org. Archived from the original on 8 March 2017. Retrieved 7 March 2017. ^ "Synchronization with Native Applications". NTT DoCoMo. Archived from the original on 6 August 2016. Retrieved 26 May 2016. ^ Sean Owen (17 January 2014). "Barcode contents". Archived from the original on 15 February 2016. Retrieved 26 May 2016. ^ Rimma Kats (23 January 2012). "Starbucks promotes coffee blend via QR codes". Archived from the original on 3 June 2016. Retrieved 26 May 2016. ^ Jenny Lee (4 January 2012). "Tesco's cool QR code advertising campaign". Archived from the original on 3 June 2016. Retrieved 26 May 2016. ^ "Getting Started with Infographics (deprecated)". google-developers.appspot.com. 26 May 2015. Archived from the original on 29 June 2016. Retrieved 27 May 2016. ^ "QR Code Readers for iPhone, Android, Blackberry and Windows Phone 7". 7 December 2010. Archived from the original on 25 August 2011. ^ "QR codes on China's train tickets may leak personal information". Want China Times. Archived from the original on 12 December 2013. Retrieved 16 March 2013. ^ "Geo Tagged QR Code Map". Archived from the original on 30 May 2016. Retrieved 27 May 2016. ^ Novak, Asami (23 March 2008). "Japanese Gravestones Memorialize the Dead With QR Codes". Wired. Archived from the original on 15 February 2013. Retrieved 8 May 2013. ^ Skepticality (5 July 2011). "Paranormality". Skepticality.com. Archived from the original on 3 July 2015. Retrieved 27 June 2015. ^ "Herdenkingsmunt met QR code volop in het nieuws!" [Commemorative QR code in the news!]. Koninklijke Nederlandse Munt (in Dutch). 21 June 2011. Archived from the original on 29 June 2016. Retrieved 27 May 2016. ^ "New ₦100 Commemorative Centenary Celebration". Archived from the original on 8 September 2015. Retrieved 10 September 2015. ^ www.ETRetail.com. "With IndiaQR launch, retail payments to get digital edge - ET Retail". ETRetail.com. Archived from the original on 15 February 2017. Retrieved 15 February 2017. ^ "IndiaQR to debut on Feb 20 - Times of India". The Times of India. Archived from the original on 16 February 2017. Retrieved 15 February 2017. ^ "16 August 2011". Archived from the original on 5 April 2016. Retrieved 27 May 2016. ^ "Tesco QR Code Virtual Store". 14 April 2012. Archived from the original on 25 May 2016. Retrieved 26 May 2016. ^ Sebastián Campanario (16 September 2011). "Marketing futurista: ya se puede comprar con la cámara del celular" [Futuristic marketing: it's already possible to purchase with a cellphone's camera] (in Spanish). Archived from the original on 23 September 2011. ^ "Marketers scatter phone-friendly codes across ads". 11 November 2010. Retrieved 26 May 2016. ^ "Top 10 QR Code Store examples". 14 April 2012. Archived from the original on 6 June 2016. Retrieved 26 May 2016. ^ "SCVNGR Unveils QR Code Payment System". Archived from the original on 8 December 2012. ^ "MasterCard starts piloting QkR mobile payment app". 26 January 2012. Archived from the original on 8 January 2014. ^ "Standard - Formát pro sdílení platebních údajů v rámci tuzemského platebního styku v CZK prostřednictvím QR kódů" [Standard No. 26: Format for exchanging payment information for Czech domestic payments using QR codes] (in Czech). Czech Banking Association. November 2012. Archived from the original on 3 June 2016. Retrieved 27 May 2016. ^ "FAQ - Bitcoin". Archived from the original on 5 September 2015. Retrieved 10 September 2015. ^ "Blockchain.info - Bitcoin Wallet - Features". Archived from the original on 6 September 2015. Retrieved 10 September 2015. ^ "Google testing login authentication via QR codes". Archived from the original on 15 June 2013. ^ "Share your Wi-Fi SSID & Password using a QR Code". 19 July 2015. ^ "Barcode Contents". 10 February 2019. ^ "モノウォッチは生まれ変わります". Archived from the original on 13 November 2015. Retrieved 10 September 2015. ^ Michael Keferl (20 March 2008). "QR code graves give a "Memorial Window"". Japan Trends. Archived from the original on 2 May 2012. ^ "供養の窓 - 石の声 株式会社" (in Japanese). Archived from the original on 13 November 2015. Retrieved 10 September 2015. ^ "Quiring Monuments adds smartphone codes to gravestones". Puget Sound Business Journal. 26 April 2011. Archived from the original on 23 June 2015. Retrieved 10 September 2015. ^ "Uruguayan Jewish Cemetery QR-ified" (in Spanish). EL PAIS. 24 March 2014. Archived from the original on 3 August 2016. ^ "QR Barcode Easy". 3 March 2018. Archived from the original on 15 September 2012. Retrieved 3 March 2018. ^ "Encrypted QR Codes". QR Droid. 3 March 2018. Archived from the original on 17 September 2011. Retrieved 3 March 2018. ^ "Procedure at port of entry/departure". Archived from the original on 14 November 2016. Retrieved 31 October 2016. ^ "QR Code Usage In Japan". Studio Cliffano. 18 May 2009. Archived from the original on 21 August 2009. Retrieved 18 May 2009. ^ "Is this QR code in Fez useful?". Archived from the original on 24 February 2017. Retrieved 23 February 2017. ^ "QR Reader". Archived from the original on 24 February 2017. Retrieved 23 February 2017. ^ "Information capacity and versions of QR Code". Denso-Wave. Archived from the original on 29 May 2016. ^ Orli Sharaby (18 October 2010). "Form Meets Function: Extreme Makeover QR Code Edition". Archived from the original on 8 July 2012. Retrieved 29 July 2011. ^ Hamilton Chan (18 April 2011). "HOW TO: Make Your QR Codes More Beautiful". Archived from the original on 10 July 2012. Retrieved 29 July 2011. ^ Russ Cox (12 April 2012). "QArt Codes: How to make pictures with QR codes, part II". Archived from the original on 21 March 2015. Retrieved 8 May 2015. ^ Russ Cox (12 April 2012). "QArt Coder". Archived from the original on 24 April 2015. Retrieved 8 May 2015. ^ Information technology — Automatic identification and data capture techniques — QR Code 2005 bar code symbology specification, ISO/IEC 18004:2006 cor. 2009, pages 3, 6. ^ "QR Code Overview & Progress of QR Code Applications" (PDF). Archived (PDF) from the original on 20 May 2013. Retrieved 26 June 2014. ^ "iQR Code - QRcode.com - DENSO WAVE". Archived from the original on 7 September 2015. Retrieved 10 September 2015. ^ "Embedding Secret Data in QR Code". Retrieved 29 October 2018. ^ "SQRC". qrcode.com. Retrieved 26 December 2017. ^ "Frame QR". qrcode.com. Retrieved 26 December 2017. ^ a b "About the patent". Denso-Wave. Archived from the original on 25 June 2016. Retrieved 26 June 2016. ^ "DPA". "INPI". Archived from the original on 13 August 2016. "UK IPO". 9 March 2013. ^ "QR Code.com". Denso-Wave. 6 November 2003. Archived from the original on 15 September 2012. Retrieved 23 April 2009. ^ "UK QR Code Trademark". Archived from the original on 15 September 2012. ^ "EU QR Code Trademark". Archived from the original on 15 September 2012. ^ "US QR Code Trademark". Archived from the original on 15 September 2012. ^ a b "Jargon Watch", Wired, 20 (1), p. 22, January 2012 . ^ "Malicious Images: What's a QR Code". SANS Technology Institute. 3 August 2011. Archived from the original on 13 July 2012. Retrieved 31 August 2011. ^ "Barcode Scanner". 1 June 2011. Archived from the original on 15 September 2012. Retrieved 31 August 2011. ^ "QR Droid". 19 August 2011. Archived from the original on 15 September 2012. Retrieved 31 August 2011. ^ "ScanLife Barcode Reader". 24 May 2011. Archived from the original on 15 September 2012. Retrieved 31 August 2011. ^ "Consumer Alert: QR Code Safety". Better Business Bureau. 23 June 2011. Archived from the original on 15 July 2012. Retrieved 31 August 2011. ^ "AVG Cautions: Beware of Malicious QR Codes". PC World. 28 June 2011. Archived from the original on 7 September 2012. Retrieved 31 August 2011. ^ "EvilQR – When QRCode goes bad". AppSec-Labs Blog. 14 August 2011. Archived from the original on 15 September 2012. Retrieved 31 August 2011. ^ "QR Codes: A Recipe for a Mobile Malware Tsunami". Cyveillance, Inc. 20 October 2010. Archived from the original on 28 July 2012. Retrieved 31 August 2011. ^ QR Codes hold up to 2.9 KB whereas the smallest known computer virus is about one-tenth that size "The Smallest Virus I Could Manage". Virus Labs and Distribution. 1995. Archived from the original on 15 September 2012. Retrieved 31 August 2011. ^ "Beware of Malicious QR Codes". ABC. 8 June 2011. Archived from the original on 1 August 2012. Retrieved 31 August 2011. ^ "Color classifiers for 2D color barcodes" (PDF). Fedcsis.org. 2013. Archived (PDF) from the original on 24 July 2015. BS ISO/IEC 18004:2006. Information technology. Automatic identification and data capture techniques. Bar code symbology. QR Code. Geneva: ISO/IEC. 2000. p. 114. OCLC 60816353. BS ISO/IEC 18004:2006. Information technology. Automatic identification and data capture techniques. QR Code 2005 bar code symbology specification. London: BSI. 2007. p. 126. ISBN 978-0-580-67368-9. Wikimedia Commons has media related to Quick Response Codes. Reed Solomon Codes for Coders – an elaborate tutorial on Wikiversity, covering both QR code structure and the Reed Solomon codes used to encode the data.